I don’t know that I was actually in a groove before. But I’m starting to have bits and pieces of time I can call my own and I’m feeling creative again. Yesterday was the first time I’ve actually picked up a hook and crocheted in a long, long time. For some reason I seemed to be almost avoiding it. Maybe the snippets of time I have are so small that I felt overwhelmed at the thought of starting a project. But as I started catching up (a little bit) with the fiber blog world, I saw Drew’s request for squares for Heartmade Blessings and I thought, “A granny square. That’s small. I can do that.” So I grabbed a skein of acrylic from my stash and started stitching. 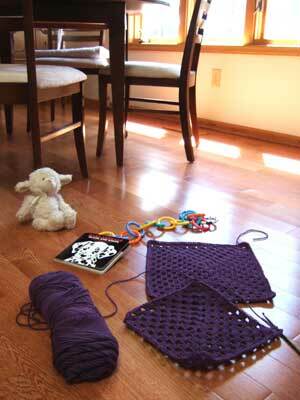 Have I mentioned I’m totally, utterly, completely addicted to making granny squares? I could do it all day. Really. I love the rhythm and uniformity of it. Just having a hook in hand has helped me start hatching some designs from ideas that have been incubating in my head for a while. I’m still spending most of my time with the baby, but getting the creative wheels turning again feels good. That’s why baby’s take naps…so we can crochet! I used to crochet during nap times. Now my kids are in college and high school. Enjoy these days. They are the best of your life. Oh, and I still crochet. I’ll never forget the time that I was crocheting a lacy edging for a pair of pillow cases for a wedding gift. I was making great progress until my second son crawled up, pulled up on the couch, and proceeded to pull out about a mile of my beautiful lace. He was so happy with himself and so cute that I couldn’t bear to get upset with him. Now he’s a freshman in college, and he still has that same charm that gets him out of many tight fixes!!! hey donna! good for you:) i agree with the granny squares! i love making them too. i have found the 63 squares afghan very therapeutic!